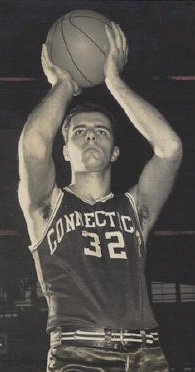 Bill Della Sala was a Forward for the UConn Huskies from 1960 – 1965. He holds the record for the longest shot in the history of UConn, when he threw the ball from inside the other end of the court, to the basket, and it went in when the team was running out before half time during one game. 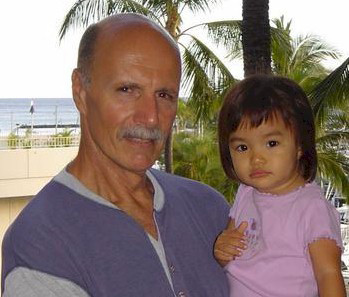 I spoke with Bill from his home in Hawaii in May 2005 about his basketball memories. Bill grew up in Cranford, New Jersey. There was a basketball court near his house, and that’s where all his time was spent beginning at the age of eight. In the 1960’s there weren’t any youth leagues, there were just pick up games so he didn’t play organized basketball until he reached high school. When he was a freshman in high school he tried out for the freshman basketball team but had a slight knee injury, and it kept him from playing that year. As a sophomore Bill was coached by Rollie Massimino, who went on to win a National Championship as head coach of Villanova University in 1985. Bill's junior varsity coach and later assistant varsity coach was Hubie Brown who will be inducted into the Springfield, Massachusetts Basketball Hall of Fame in September, 2005 and Bill's varsity head coach was Bill Martin, the best high school coach in New Jersey (Bill's opinion). 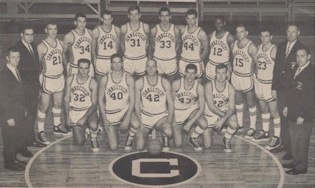 While at Cranford High School, Bill said, “Al Ritter and I were the leaders on the team. We both shared the spot light. Al and I had some good times, some good games. The most memorable games at high school I guess were the disappointing ones. The ones you regret, and wish you had to play over again.” Bill’s high school teams always played well throughout the season, and during his junior year they lost in the finals of the county tournament, and during his senior year they lost in the semifinals. Bill was recruited by Rutgers University in New Jersey, University of Pennsylvania, La Salle University, and as far away as the University of Colorado. It was UConn that was the most aggressive in recruiting him. They kept attending his high school games, and stayed in touch with him. Bill didn’t remember the transition from high school to college to be very difficult. “Basketball was about all I was interested in back then. I was very focused, and concentrated on that as a freshman to the extent that it took away from my academic performance. I dropped out in my sophomore year.” Things changed, a new Head Coach, Fred Shabel, took over, and Coach Shabel contacted Bill, and talked him into coming back to school, and continue to play basketball. 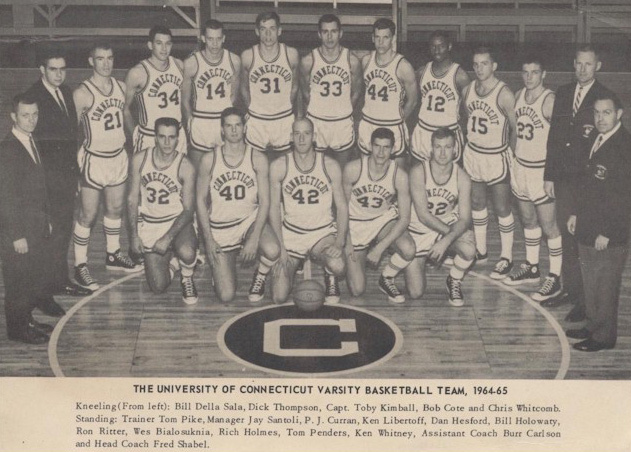 “I owe him a debt of gratitude for doing that because I’m not sure if I ever would have gone back to school on my own.” During Bill’s years on the varsity basketball team at UConn (back then you couldn’t play varsity as a freshman) they had some excellent teams. “We had Toby Kimball on our team, one of the best big men I ever played with. We also had Wes Bialosuknia and Bill Holowaty.” During Bill’s junior year the team was in the National Collegiate Athletic Association Tournament, and got to the Finals of the Eastern Region. “We beat Temple in the first round, and in the second round we played against Bill Bradley of Princeton, and beat them by a point or two when Dom Perno of UConn stole the ball from Bill Bradley with just a few seconds left in the game.” Bill’s last season with the team they only had two losses. He was going through some personal situations, and didn’t finish the season, and dropped out of school for a second time. The team went on to the NCAA Tournament, and Bill remembered watching them play in the tournament on television from home. Bill goes back to New Jersey every couple of years to visit family but he hasn’t been back to Connecticut since he received his degree, although he recently had memories of being on the UConn campus. Bill saw the movie “Ray” about Ray Charles who has always been one of his favorite performers. He remembered one year on campus the dean of students whose name happened to be Jack, had attempted to outlaw drinking on campus at parties. It created quite an uproar. As a way of protesting, students would play their stereos out the window, and the song that they would be playing was “Hit the Road Jack”. No matter where you walked on campus you’d hear that song. Bill met his first wife while at UConn but it was short term. While in Guam he met, and married Cecilia. They separated some years ago but they have three children. Marcus was born in Guam, and is 33 years old. Marcus played basketball as a youth until he reached high school. After high school he joined the army where he served for 9 1/2 years (7 1/2 years active duty and 2 years Army National Guard). In 2000 Marcus switched over to the Air Force and joined the Hawaii Air National Guard full time. Marcus and his wife Raelynn are now living in Oahu, and have a daughter, Malia age 3 and a son Kaleo born April 30, 2005. Bill’s daughter Angela is age 27, and was introduced to sports as a child, and is currently attending the University of Hawaii in Oahu, pursuing a degree in Education. Anthony is the third child, age 23 currently living in Waikiki. He’s a waiter in the tourist area enjoying life, and has recently considered going to college.